A heated hoodie is a great accessory for keeping your core warm when the temperature drops. Fall and winter can bring on some unpredictable temperatures. In Wisconsin, it’s a regular occurrence to walk to work in the morning with a winter jacket and be in a t-shirt by 3 p.m. For days like this, it’d be great to have a sweatshirt or light jacket that can handle extreme cold and be comfortable for mild temperatures. The Ravean heated hoodie and jackets work wonders for weather like this. The Ravean heated hoodie is a great hooded sweatshirt for hunting, hiking and enjoying any type of outdoor weather. I’ve personally used heated clothing and gloves before, but the Ravean heated hoodie is the first hooded sweatshirt I’ve tried with built in heating. The battery charges quickly and is lightweight that you hardly notice it’s in the zip up hoodie. I was outside in 40 degree temperatures and was really comfortable with the heat set on a mid-temperature setting. This hooded sweatshirt is one of the best clothing pieces an outdoor lover can own. The settings of the hoodie will keep you warm no matter what the temperature by simply turning it up. The batter, which weighs less than a pound (.5 lb), can be fully charged in just 90 minutes so you wont have to wait around. Another huge benefit is that the batter can even charge your cell phone up to 6 times! If you’re skiing and need a re-boost or if you’re out on an all day hike or hunt, this can come in very handy. 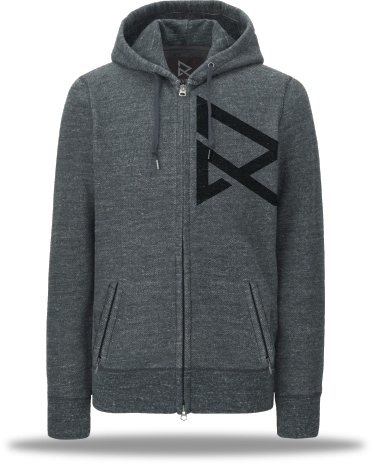 The Ravean heated hoodie looks good and comes in black or gray. While we’d love to have the logo be a little smaller, this garment is perfect for wearing under a light jacket for hunting or on it’s own for hiking. If anything breaks on the hoodie, you also have the comfort of knowing that you have a 5 year warranty on the heating system. Wash it, toss it around, step on it, whatever. The Ravean heating system is tough and built for outdoor people who will beat it up so make sure you put it through the ringer. You can pre-order your own Ravean heated hoodie here on Kickstarter. Check out their full line of products on their website too. For more of the latest hunting gear reviews, be sure to check out MorningMoss regularly.